Be "open" in your choice of overnight parking. Adopt a "slow way of going" travel routine. Enjoy more and spend less! Overnight parking combined with our travel routine has possibly the greatest potential for keeping our budget in the black. I hold not one thing against the parks. For a lot of people they're the cats meow. That's fine. The whole idea is to do what suits you! They just don't suit me, and thats fine too. 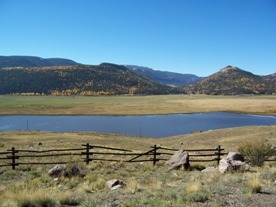 If we're not rv boondocking along some creek or beside some mountain lake we're usually traveling between such places. When all we need is a few hours rest, not wanting or needing a hookup of any sort, I just can't justify in my pea sized Cowboy brain dropping $25 - $35 for overnight parking. We use Wally World! I don't want to get into the politics of wal mart but the fact is the free overnight parking there is too convenient, many times, to pass it up. If an alternative presents itself I'll use it. But otherwise I don't have much of a problem using the parking lot for several hours of overnight parking, while in transit. To keep it honest we thank the store and the town for their generosity by stocking up our groceries in the store, fueling up before we leave town, and often having a light breakfast in one of their local cafes. Maybe even doing a bit of laundry! ****and in regards to those towns which prohibit such stopping? That try to force RVers into $30 parks for a few hours overnight parking? We just roll on by! Just down the road is a town that WILL sell me fuel, groceries, restraunt meals, repair parts, etc. with a little more courtesy. I think I understand their concerns and so we exercise proper RV etiquette ( see elsewhere on the site!) when we do stop. But their interference in a private agreement between wal mart (or other places) and myself is in my opinion, misguided. It will cost them the sales I would have spent in their town as well as the taxes! If we're in an area where National Forrest campgrounds are available we use them for our overnight parking! With my discount (My VA disability gets a 50% Discount with the Nat. For. Svc. and Park Svc.) an $8 NF campground is just $4. That isn't bad at all for an overnight as far as I can see. Heck, even if it started out at $12 the $6 I have to pay doesn't get my shorts in a knot! Their Golden age pass does the same thing if you're lucky enough to be an old guy or gal! No need to bust your back in the army! Check it out! On occasion, we'll overnight in a highway rest stop, though they can be noisy. They do require, I think, a little greater attention to safety and security. But if you exercise reasonable caution and awareness you'll be fine. We've never had a problem in one. If you do pull in and ANYTHING makes you uneasy, pull out and roll! Makes no sense to worry. Just keep on rolling till you find someplace acceptable. Common sense will carry you a good long ways. Often, like George and Tioga, we just find a quiet widespot in the road and pull in for our overnight parking. If we use a little discretion and etiquette, park out of everyone elses way we seldom get hassled. Fact is I can't remember the last time. Again, some common courtesty goes a long way. 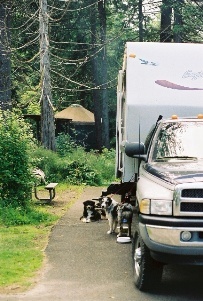 George is a past and ongoing master at RV Boondocking and free overnight parking. We aren't as disciplined at the free side of the deal as he is but we do pretty fair if I say so myself. 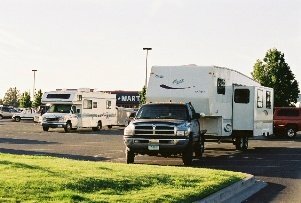 Now don't get me wrong, I don't consider wal mart overnight parking to be boondocking. Set up at the bottom of a Sonoran Desert hill with a gorgeous view of the blue mountains across the valley is boondocking! Wal Mart overnight parking is just that. Parking for a while in a parking lot. We value it highly for what it gives us, but it is not boondocking. What it gives us is the savings in our travel expenses to allow us to travel and see more! Relax, don't get uptight. Enjoy the day! I think the biggest mistake people make ( I know it because I used to be the same darn way!) is to engage in the "National Lampoon Vacation". Hammer down, 5,000 miles, 19 states, 98 attractions in only two weeks! They roll through so fast, trying to make miles, that they couldn't describe what they saw if their lives depended on it! Their pictures are a blur, literally! They were going past at 75 mph! They didn't see a thing. Stop and smell the roses. Force yourself to slow down for a few days. Push yourself into the slower pace, the easier routine. After a few days you won't have to force yourself. Leave that hectic pace and pressure to go go go, see see see, run run run, behind. Hear that Eagle scream as you stand in the shade under a Ponderosa pine for a bit, just being. Listen to the wind in the grass as you watch the shadows change up in the rim rock across the canyon, and the sun sinking out of sight below the western horizon. It's amazing what you'll see from a widespot in the road, just overnight parking! Cover fewer miles and see more of this glorious land. We don't have to be anywhere. If we slow down, the territory we're in will have time to soak in a bit. We'll have time to appreciate the beauty that's all around us. 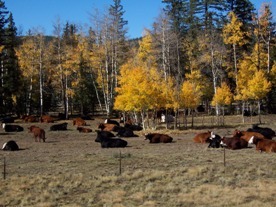 Kind of soppy for a Cowbuy, huh? Oh well. Some of us get down right poetic halfway through a sixpack! The rest just fall asleep. Heidi and I only travel 150 miles a day, or so when we're "moving camp" and only for two or three days. Overnight parking for those nights. Then we set up in a boondock camp for a week or two daytrippin' out from there. We go slow. And guess what? That slower pace is going to (hear comes a fuel saving tip )save you money! Slower speed, fewer miles, fewer gallons of fuel burned. More pic niks! ( fewer meals at restraunts). The relaxed pace may even get you healthier and result in lower blood pressure! And fewer doctor bills! 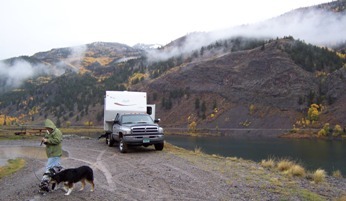 Overnight parking is just a part of RV Boondocking. 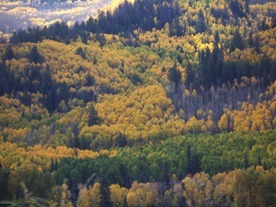 But it's an important part, and you can shape it to be nearly as enjoyable as that backcountry camp! A good time and save money at the same time?! Sweet! See you down the road. Maybe in some pretty little widespot, overnight parking on the way to our Boondocking camp!